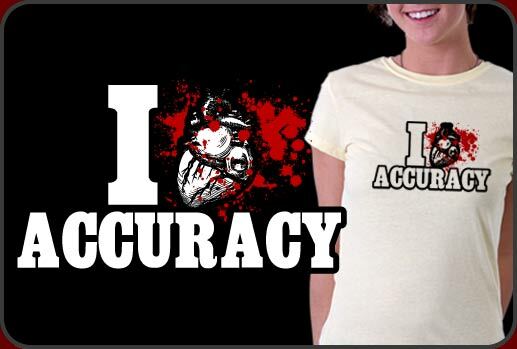 Graphically correct I Heart Accuracy shirt gets the heart pumping! Look we are fans of accuracy as well but this may be taking things overboard. I Heart Accuracy shirt is a great looking design that features a life-like human heart illustration in place of the normal valentine heart you see on other I heart shirts. A very funny and appealing shirt that gets noticed immediately. I heart accuracy shirt looks great on either the light or dark shirts we have.